It is the rare file that comes in for editing that doesn&apos;t have extraneous material that needs cleaning up. Some things need to be universally done, such as removing the space before a period or a comma, and other things are unique to the specific project, such as a client wanting an em-dash replaced with three hyphens. The Cleanup macro is designed to meet both those needs. As shown in the following image, Cleanup, Cleanup Manager, and Cleanup Specialty Manager are found on the Never Spell Word tab. Cleanup&apos;s Manager&apos;s work just like the Toggle Word Managers. As the image below shows, the main Manager lets you open or create a new file or use a specialty file in addition to the primary file. (To use the specialty file, just check the box indicated.) You will also note in the example the presence of [space] entries. This feature is new to EditTools version 5. Now when you enter a space by pressing the spacebar on your keyboard, if the space precedes the entry or follows the entry, it will appear as [space] so that you know a space is included. It will not appear between words in a phrase. For example: [space]proper nouns[space]. 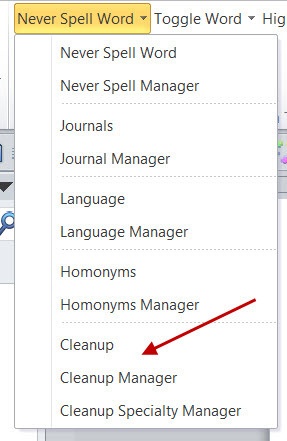 To run the Cleanup macro, simply click Cleanup in the Never Spell Word menu. It runs with track changes off. This macro is not intended for use with anything that should be tracked; use the Never Spell Word or Toggle macro (or other appropriate macro) if a change must be tracked. This macro is intended for routine cleaning up of extraneous material or for changing items that need not or should not be tracked. In addition to having its own place on the Ribbon, Cleanup has added four new macros. They appear on the Cleanup Menu (#1). 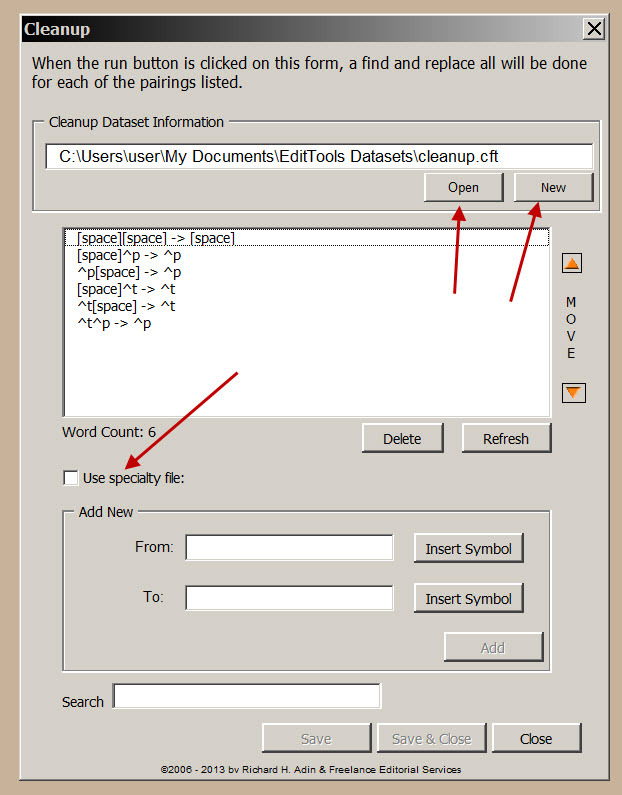 Click on Cleanup Menu (#1 above and arrow below) expands the Cleanup Menu, displaying Delete Unused Styles plus two new macros: Set Template To Normal and Remove Table Cell End Spaces (#2). Although the macro names are self-explanatory, some words of caution: First, clicking Set Template To Normal resets the template of the file to your original Normal Template. Anything you have added to the template but not saved as part of the Normal template will be lost. The second caution is that the Remove Table Cell End Spaces sometimes removes the extra space and sometimes doesn&apos;t. The macro doesn&apos;t cause any problems, it just doesn&apos;t always remove the space and it isn&apos;t clear why it doesn&apos;t.
The other two new macros, Remove Formats and Reinstate Formats (#2), are discussed on their own page.